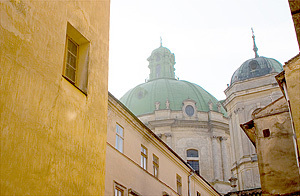 The wonderful Western Ukrainian city of Lviv is celebrating its 750th birthday this week. Various anniversary shows, exhibitions and other events are drawing crowds both from Ukraine and from abroad. Below are several Ukrainian bloggers' reflections on what the city feels like on ordinary days, when the spotlight isn't as intense as it is now. We made up our minds at the end of the week, and Lenka booked the tickets nearly right away. It took me two minutes or so to get packed ([my EOS 300D in a small biking backpack, plus my jacket]). So on Saturday, at 9:40 PM Kyiv time, we were inside the train car for half an hour already, enjoying the taste of Lvivske beer that we had bought in advance. And this seems to be a tradition - because our compartment-mate was also drinking Lvivske, and on our way back, our neighbors had Lvivske, too. I was looking through my friends' journals and saw antirog's sad photo story about Lviv from two months ago. I looked at it - and copied it here. Love me the way I am and maybe one day I'll grow better. I don't know whose thought this is, but it's a wise thought. We love Lviv the way it is, and we are genuinely happy about every new, and good, outfit it gets. I understand the feelings of the story's author (by the way, there are also photos of Warsaw at his site, and only garbage containers look neat on them) - of course, everyone who arrives in Lviv through the Western border, notices the paint peeling off the buildings, heaps of garbage and anti-Semitic and anti-Russian slogans written on the walls and fences. The former is just yelling about our poverty, and the latter is a sign of the obvious presense in the city of mean and foolish people. We also suffer from this poverty, especially since it all too often spreads from the walls into our plates. As for the latter, well, let the resident of a city that doesn't have the mean ones and the jerks, throw the first stone into my computer screen. Everything passes and this will pass as well. Only Lviv will remain, the city we love. The city that, despite it all, is getting better every year. We believe in our city.